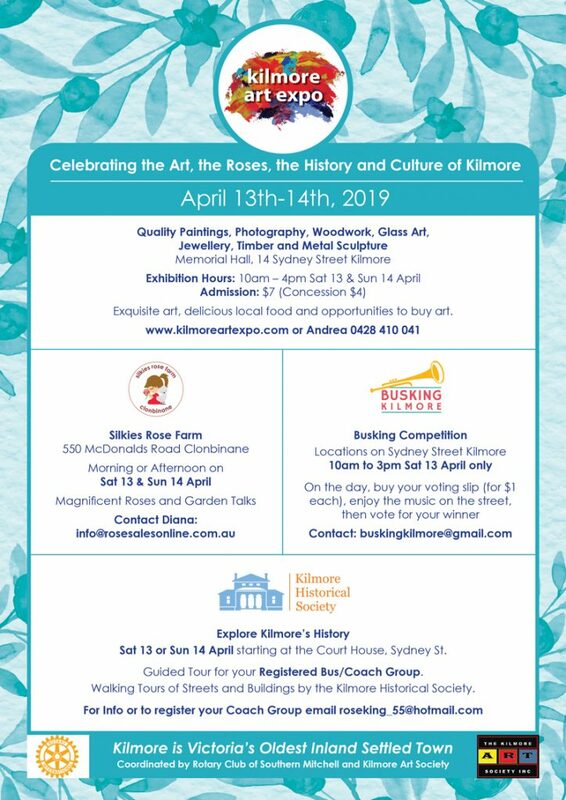 Hello dear rose friends as we prepare for the Art & Roses Tours this weekend when busloads come to visit for a Walk ‘n’ Talk in the garden with Graham as part of the Kilmore Art Expo and Busking Competition (Saturday only). Kilmore will be literally buzzing this weekend so do come for a visit! As people stepped from their cars these past weeks they’ve been very vocal about how beautiful our place looks and how many roses there are on show; the pots look amazing but the gardens are beautiful too! Let us assist with designing your rose garden so that you get it right first time! Bring your ideas, pictures and sketch drawings so that we can work on the garden design together! Q. What can you catch but never throw? A. A cold! It’s that time of year when you need to line up for a flu shot to be sure you stay well this winter! 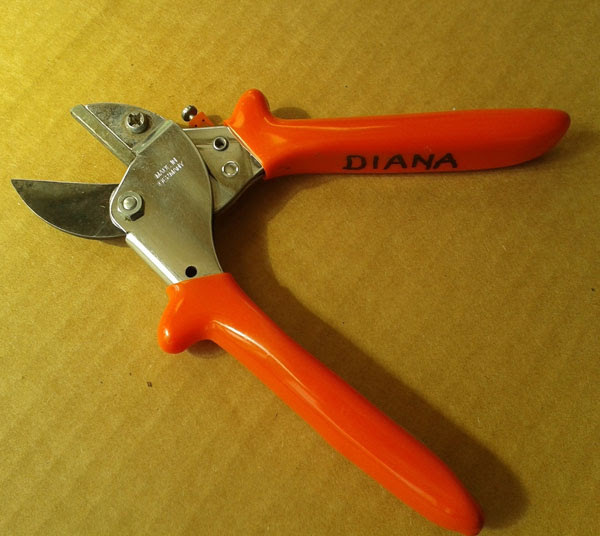 Hello Graham – I was interested to see your plug for those fabulous secateurs. Since you advised my son Lucas to purchase a pair for me I have recommended them to people who have since purchased them and are equally delighted, as I am. My response: Thanks Helen – following this email and other similar requests I will attach the following to each pair we sell in future – it’s very important to care for your precious garden tools! CARE INSTRUCTIONS FOR THE BEST SECATEURS YOU’LL EVER OWN! Once a week during frequent use, open and spray secateurs blade and shaft with surface spray, leave a few seconds and whilst still wet, scrub all surfaces with steel wool then dunk in warm soapy water to soak. Scrub again if necessary. Using a fine wire remove all grit from shaft area, rinse and turn upwards to air-dry completely. Run sharpener two or three times evenly along both sides of anvil blade; lightly spray both sides of blade with olive oil. P.S. Highly recommend you purchase a clip-on holster to avoid leaving secateurs in the garden! REAPPLY MULCH (WHILE THE SOIL IS STILL WARM) TO AREAS WHERE PREVIOUS MULCH TURNED TO HUMUS – PROTECT THE HUMUS AND WORMS FROM FROST – REMEMBER, WORMS START BREEDING SOON! IF YOU HAVEN’T ALREADY, YOU MUST APPLY FERTILIZER NOW! HIDE EASTER EGGS IN THE GARDEN – KIDS JUST LOVE IT! Q. Where do you learn to make banana splits? A. At Sundae School. 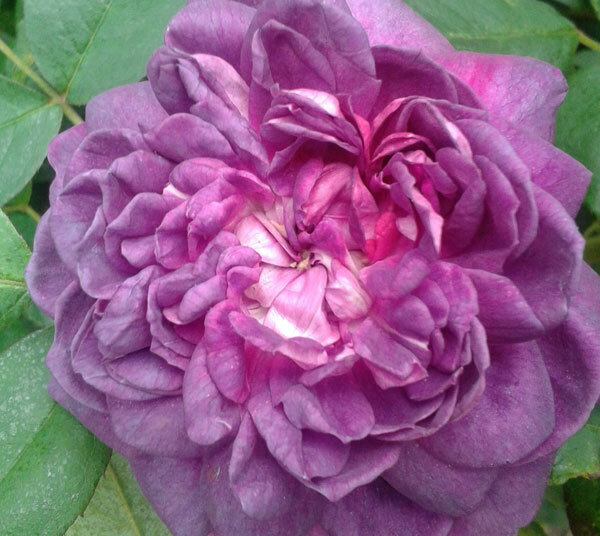 Unless there is anything really pressing to share with you next week on Thursday, 18th April, the day before GOOD FRIDAY, this is the last Rose Rambler for a few weeks. Please note WE WILL BE CLOSED ON GOOD FRIDAY but otherwise open during the Easter weekend on our normal days Saturday, Sunday and Easter Monday. 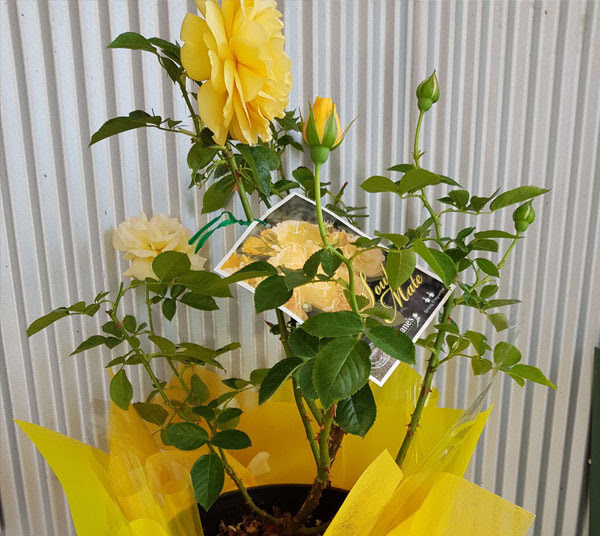 You will receive your NEXT ROSE RAMBLER ON 2ND MAY as we, in respect of ANZAC DAYon Thursday, 25 th April, won’t be posting a Rose Rambler that day. ONLINE STORE AND WINTER ORDERING – DO IT NOW! Diana and Ben have been very busy loading lots of new photos to our online store: www.rosesalesonline.com.au ready for you all to indulge in selecting new roses from our bare-rooted selection of roses for this winter and ask you, please, if you see faults or issues whilst purchasing in our online store, kindly take a moment to email us at: info@rosesalesonline.com.au so that we can correct those mistakes – we’ll honour your email to us by posting a free rose this winter as thanks for your effort! THE OPPORTUNITY ROSE is a profuse bloomer, the habit is compact and a little over knee high. The medium sized buds have attractive form, the rich variable copper shades are not prone to premature fading. It has very high resistance to blackspot when compared to neighbouring varieties and a distinct light fragrance. 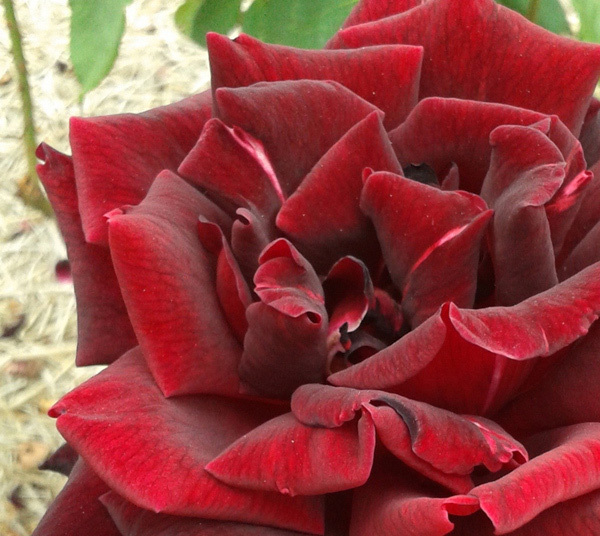 CAMP DAVID … Hybrid Tea dark red rose and one of the most stunning! This rose is one of the most abundant Hybrid Teas, producing the darkest red, red roses – no purple in this beauty as I refer to it as ‘brown red’ … it stays dark red all the way through to petal drop and it has the most glorious fragrance. 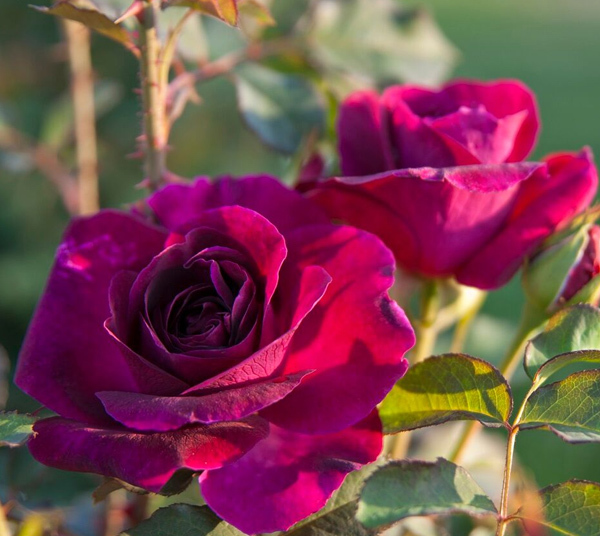 CAMP DAVID is definitely one of our most highly recommended dark red roses – the profusion of long-lasting blooms puts this beautiful rose ahead of some of the other most frequently purchased roses! 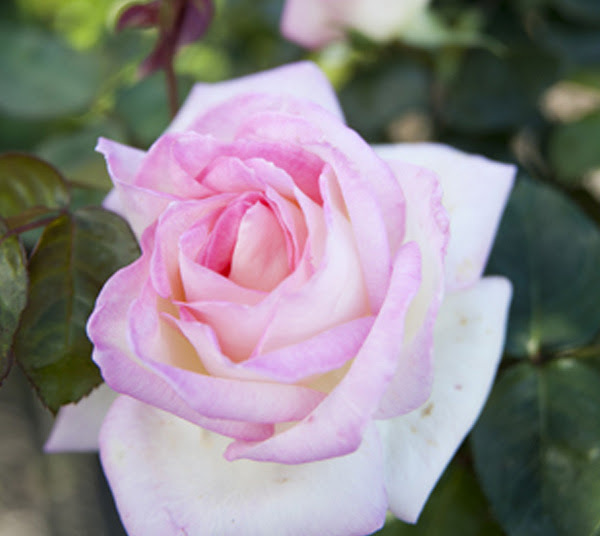 Released by Swane’s Nursery this rose is exclusively grown in Australia and our conditions are perfectly suited to this exceptionally healthy, free flowering rose. My Hero produces an abundance of classic, shining rose pink blooms which clothe the shrub over a very long flowering season. The petals are massed and have a rather old-fashioned look when the bloom is fully opened. 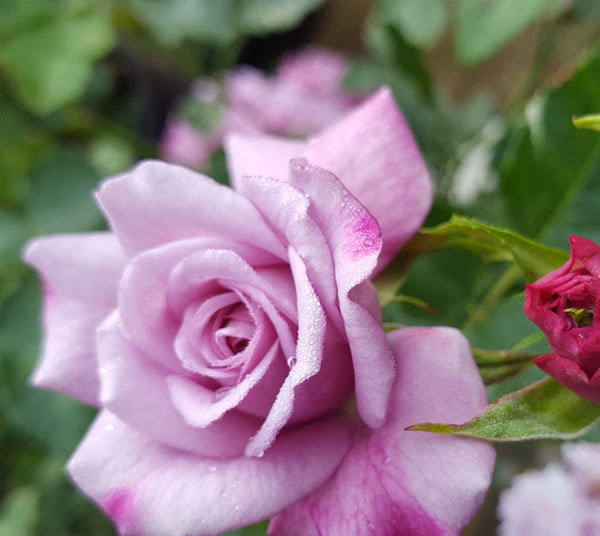 All stunning plants ready to be planted in your garden and keep flowering right into winter then lightly pruned so they are a glorious, established rose in your garden this spring and next flowering season! Enjoy these coming weeks of time off with friends and family – take care of yourselves and each other during this very busy Easter holiday time – enjoy moments in nature together when you can – hopefully, you’ll jump in the car to visit our Rose Farm during this holiday time when we will be open during our normal business hours of Fri – Sat – Sun – Mon 9am – 4pm EXCLUDING GOOD FRIDAY when we will be spending time with our family. Please remember to ask for a MEAL VOUCHER so that you can enjoy a scrumptious lunch at our local MAGPIE STUMP HOTEL in Wandong – lovely venue, delicious food! Hello dear rose friends as we approach the middle of autumn and still no sign of significant rainfall here at Clonbinane? OOOOh, the garden, the trees – they would all love to have the dust washed down off their leaves and only ‘God’s wee’ can do that on such a scale! We use our garden tools every time we go to the garden, but do we stop and consider how much we rely on them? 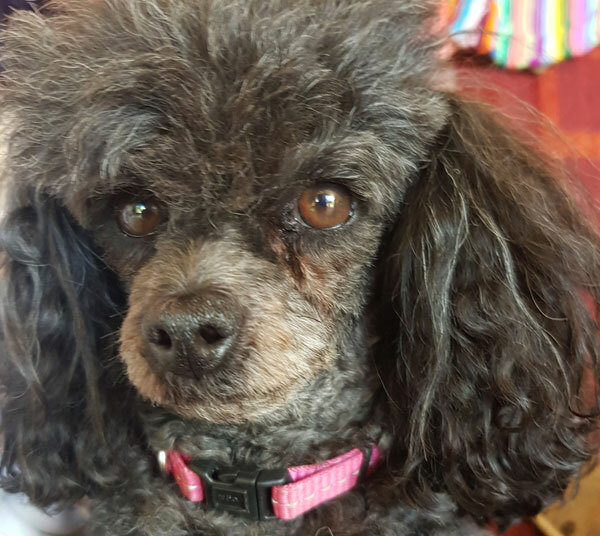 How should we care for them? Or, do we just go out and buy cheap replacements when we’re next visiting the local hardware? which is available to purchase on our website or here at the Silkies Rose Farm as we have used these for years and they are sooooo amazing … if you wish, call me on Friday-Monday to order over the phone, but otherwise, take this high recommendation and purchase from our online store, www.rosesalesonline.com.au – THE BEST SECATEURS YOU WILL EVER USE!!! Cheers and I hope your garden is thriving! Q. What does a spider’s bride wear? A. A webbing dress. 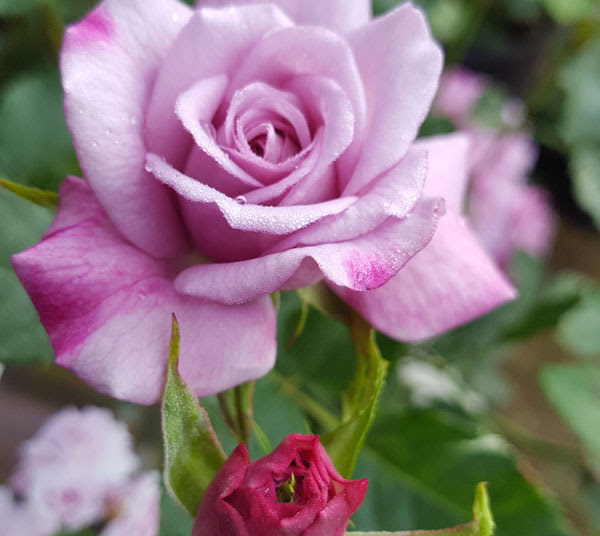 The colour describes the meaning of enduring friendship deserving of planting such a hardy, care-free, disease resistant, delightfully fragrant rose to honour your SOUL MATE. 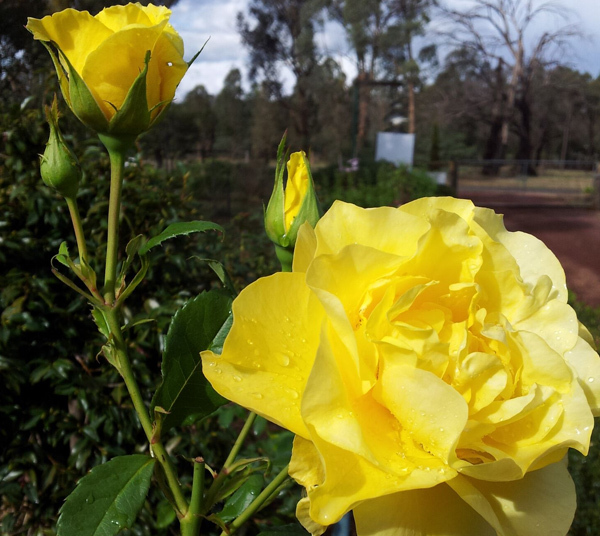 True to being a MODERN SHRUB ROSE, the foliage is amazingly healthy and the blooms are very recurrent – as a STANDARD ROSE, you will enjoy an outstanding display of golden yellow, ruffle-petalled blooms continually throughout the flowering season … very highly recommend this lovely rose! 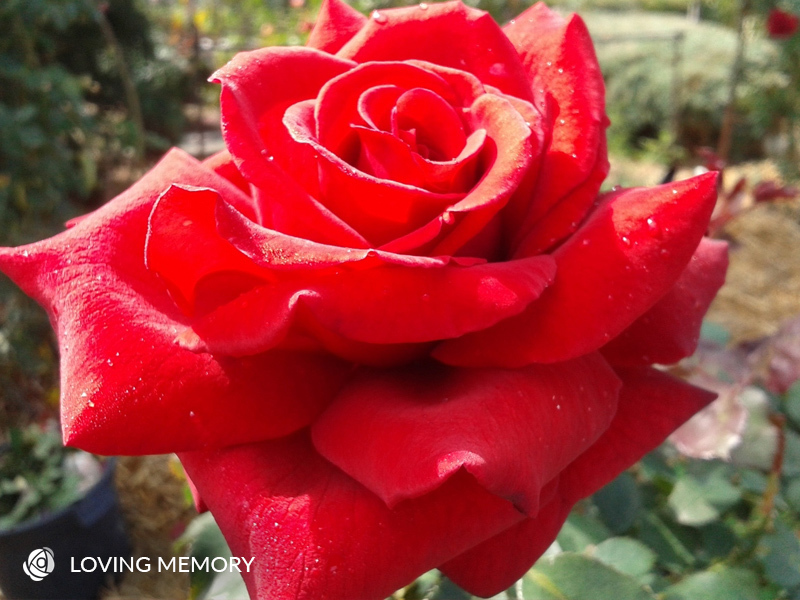 “REMEMBER ME in your heart, your thoughts and your memories is written on the rose tag and this rose is indeed purchased very frequently as a memorial plant. I am always so pleased that it is such a robust and sturdy rose so that even the most amateur gardener would be unlikely to be unsuccessful growing this rose. One of the most famous Hybrid Tea rose – the story of this magnificent rose can be read in FOR LOVE OF A ROSE by Antonia Ridge – a must read for all rose lovers! The glorious large pale yellow/cream blooms with a hint of pink at the edge are delightfully fragrant and produce a stunning continual display of blooms. 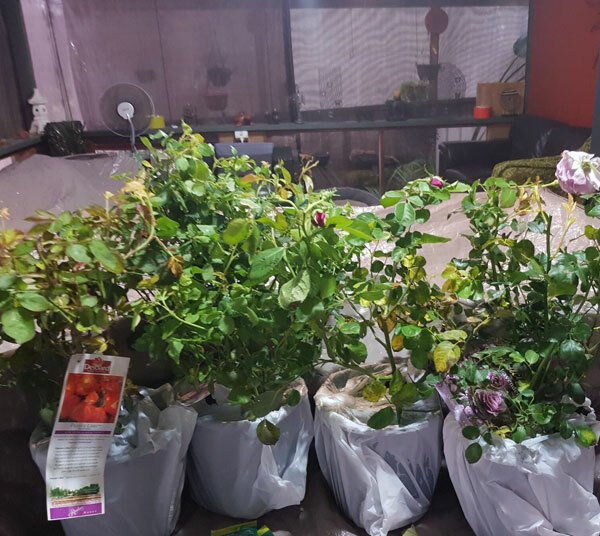 Is what we can send to you in winter when there is way less weight in the pack because as the name suggests, the roses are just ‘sticks’ and their ‘bare’ roots are wrapped in damp newspaper to ensure they stay nice and moist during transit. 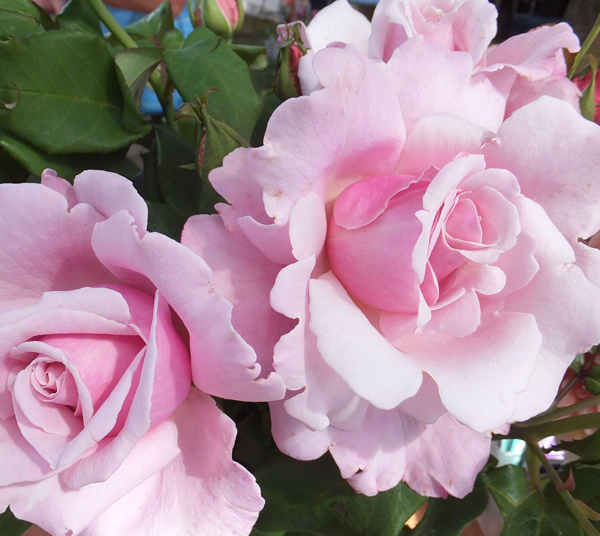 There are still many roses in pots and if you wish to have one of those sent now, obviously, there is a significant weight with very damp potting medium and roots which fill a 20cm pot of flowering rose – each pot weighs no less than 3 kg right now! 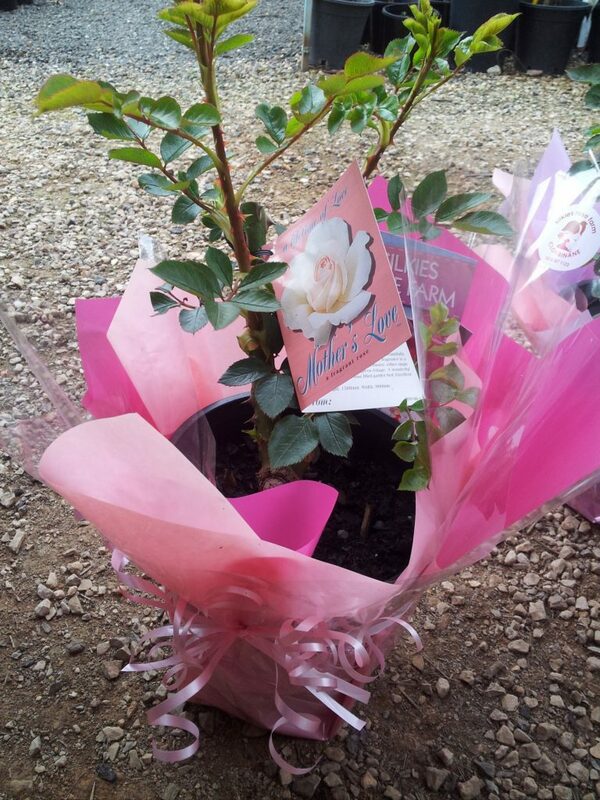 this is a premium product as one of our magnificent, organically managed, beautifully gift wrapped 20cm potted roses is posted with a lovely pictorial rose card inscribed with your personal message then packed into a stunning gift box – when possible, this rose has flowers and buds – and the price INCLUDES POSTAGE! 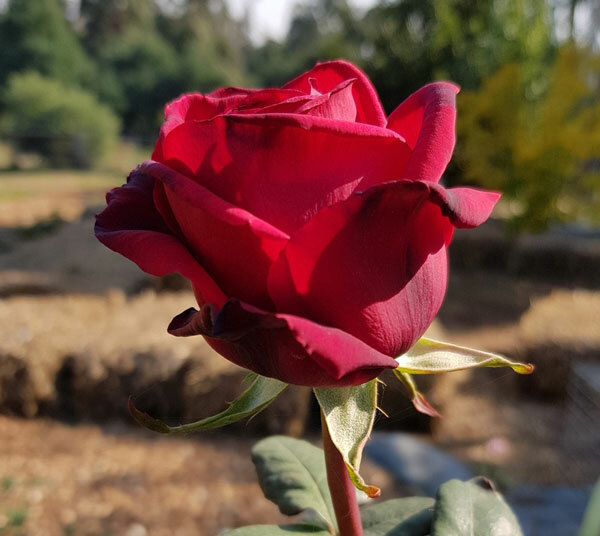 Always remember our GIFT ROSE when an event occurs in your life where posting a gorgeous rose, which reflects your loving thoughts, will have far deeper meaning than a bunch of flowers or a box of chocolates! Hello dear rose friends as we stock up the woodshed and stoke the wood fire in readiness for a cold autumn! The magnificent dahlia in the front garden which flowers from Christmas time has succumbed after the first frost a few weeks ago – yes, it’s very cold here at Clonbinane and this morning was our third frost already! Crisp, cool mornings (in the dark!) and balmy evenings until the end of daylight savings; lovely sunny days – ideal gardening weather and the roses agree by putting on their most spectacular display with intense colour and plenty of flowers. 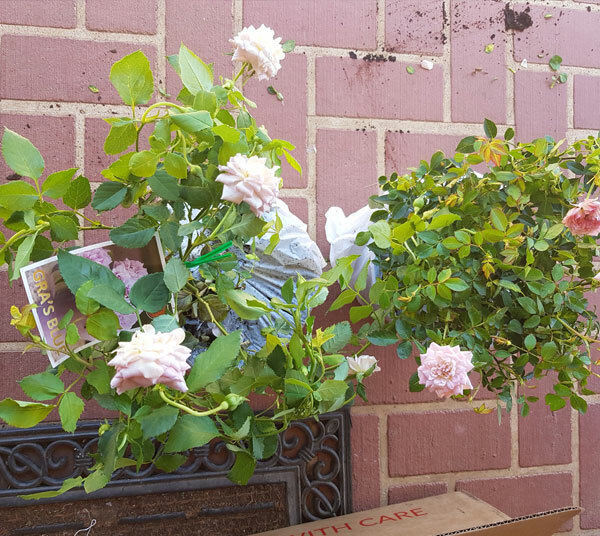 We have had almost no rain here since Christmas so we are deep-soaking the rose gardens to ensure we retain lots of flowers and healthy foliage right into the first weeks of winter. Lots of our spectacular ornamental trees have been losing leaves for a while now so we don’t expect they’ll put on their usual show of glorious autumn colour – even our large eucalyptus trees have been shedding lots of leaves and branches! All signs of an incredibly dry summer and we look forward to a good dumping of rain soon. 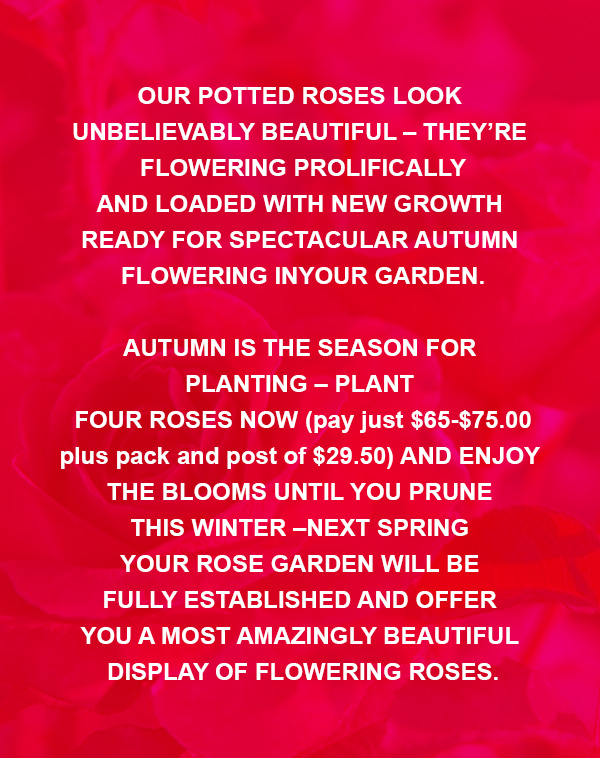 Revel in the glory of your rose garden this autumn! Q. Why did everyone jump for Joy? A. Because she was stuck to the ceiling! 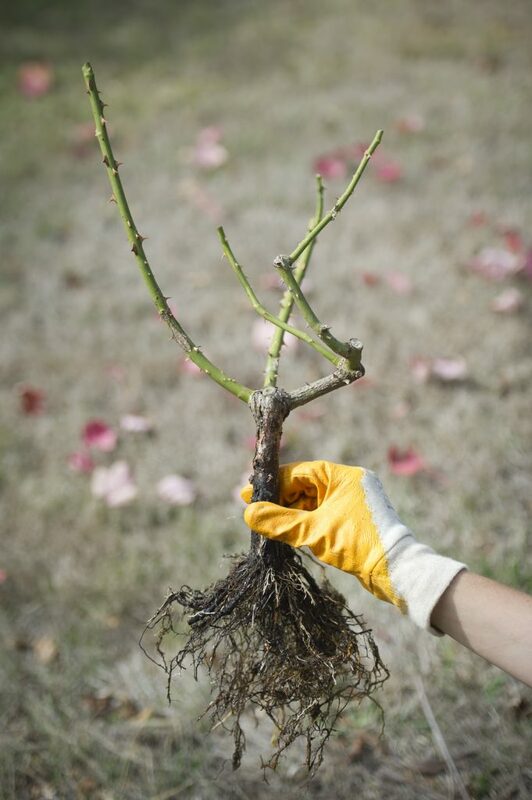 THERE’S NO BETTER TIME than right now to plant some climbing roses – if you get climbing roses in the ground now while the soil is still warm, they’ll get well established before winter and this spring, will delight you with their first spectacular flowering in your garden! Soaring Spirits is such a magnificently ‘different’ rose … single blooms which blend yellow and pink to perfection then fade to creamy white and pink so stunningly! 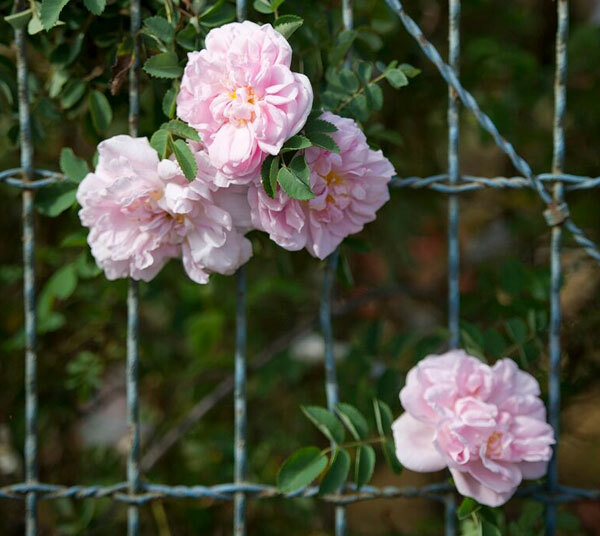 A robust growing climbing rose with healthy foliage to create a sense of ‘ooooh, aaaah’ when planted on a post of a pergola, splayed along the fence or maybe positioned in an obelisk … beautiful! 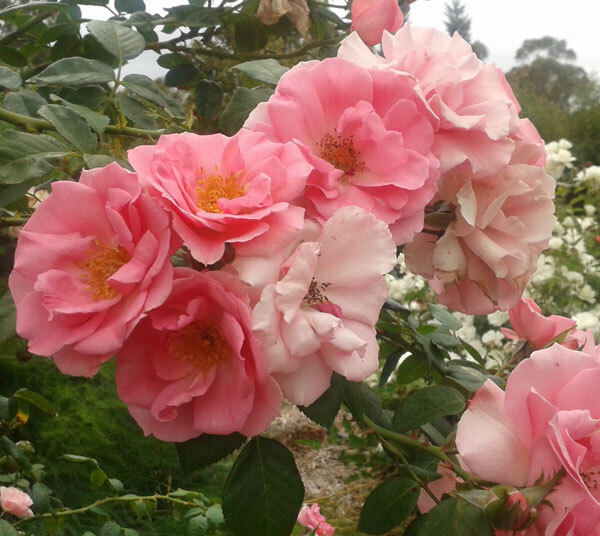 A sensational climbing rose which is never without masses of medium pink blooms over a very extensive flowering season. There are lots of thorns but the canes are easily managed whether attached to an arch or against a wall this climber will be a wonderful addition to your garden for spectacular display. Very highly recommended climbing rose! PLEASE CONTACT DIANA: 03 5787 1123 OR 0418 33 77 65 FOR MORE INFORMATION ABOUT ATTENDING THIS GREAT WEEKEND IN OUR REGION. See you soon at Clonbinane … Diana, Graham, Mooi & the team. Hello dear rose friends as we have experienced cooler nights, warmer days but hello? Where is the rain? Q. What can you catch but never throw? A. A cold! Do take care as we know there is a nasty flu going around which causes seriously achey-achey bones! Hi Liz … which mulch??? On her garden beds, Diana uses pea straw – I use ordinary barley/wheat/oat straw on my beds and then we get mulch delivered from arborists when they’re in the area and lay eucy mulch predominantly over paths but when the eucy mulch is well-rotted, we also use it to place over rose garden beds – when you were here, our team were spreading mulch over a garden bed on the eastern side – that was eucy mulch delivered more than 12 months ago and now ok to spread both over paths and that particular garden bed which still had a good layer of pea straw. 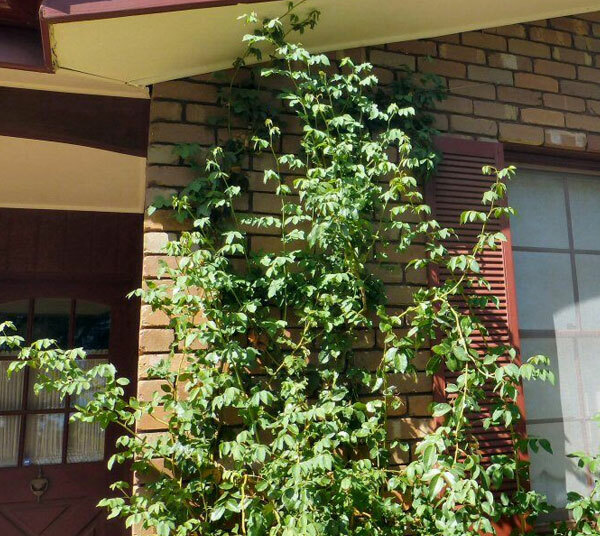 Hello … it’s almost like your home isn’t big enough to cope with this magnificent rose – let it scramble along the eaves – even over the roof (if you’re game!) because when you see this rose on an English homestead, the house is usually more than two storeys high and then MME ALFRED CARRIERE is seen at her most absolute best! Hi Diana, My name is Janette and I bought some roses from you last year. I bought 2 GERTRUDE JEKYLL – climber and 2 EARTH ANGEL. They have grown so well, GJ is now over 6 foot tall and still growing, an amazing season. EA is over a metre wide and tall and is still flowering and growing. Hi Janette … lovely that your roses are doing so well … your final comment is the answer to what’s happening with LAMARQUE – don’t prune it and you will have spectacular masses of blooms next season … cheers and enjoy! Hi Gra and Diana, Just to let you know that DELICIOUS and GRA’S BLUE arrived this morning alive and undamaged. I was worried after having temps in the high thirties Monday and Tuesday. I applaud your packing and care taken during preparation as they were in transit for nearly a week and their potting mix was still damp. Thanks again, Louise. “Thanks Louise … oh, believe me, we tuck them in and give them our very best wishes before we release them to Auspost for transit! There have been a few disasters just very, very recently and yes, it’s been hot! Lovely that your two beauties arrived a little ‘ruffled’ perhaps but they’ll recover very quickly and get on with flowering through autumn. Q. How do you know when the moon has had enough to eat? A. When it’s full! Fertilize the entire garden NOW – use a quality (organic) fertilizer with a good range of major nutrients but also take a look at the pack and see there are lots of minerals and trace elements – don’t buy just ANYTHING – buy the BEST! Regular seaweed applications will toughen your roses – will enhance and increase numbers/size of bloom/intense colour and generally get the roses ready for winter dormancy – tough roses with lots of foliage will be better able to tolerate extreme cold conditions. Not bragging but in closing, if you haven’t already planted GRA’S BLUE then you had best order one or more NOW – the plants look sensational and we heard from a customer this morning that she proudly benched GRA’S BLUE at a rose show in NSW and won a ribbon – SECOND PRIZE – she was so tickled pink that she ordered more today! GRA’S BLUE – MULTI-AWARD WINNING modern patio/miniature rose of incredible beauty, fragrance and proven disease-resistance. Have a great week in your garden knowing the roses will tough-out this incredibly dry period and continue to flower if you give them just 20 litres of water per week! Hello dear rose friends as we come up for air after an immensely busy weekend since our massive autumn promotion during last weekend! 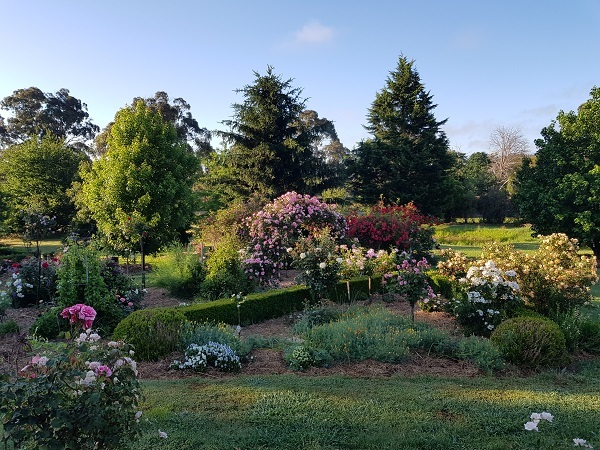 Thank you for purchasing your roses at Silkies Rose Farm, Clonbinane and www.rosesalesonline.com.au – we hope you have remembered to apply seaweed solution to your newly planted roses so they settle in well and you enjoy them flowering until around July when you will commence winter pruning. Hybrid Perpetual rose released in 1860. Stunning dark mauve highly fragrant blooms continually throughout the season on a large spreading shrub to 1.8 metres tall. This magnificent rose can be grown as a free-standing shrub or short climber which is easy to manage because it has few thorns. 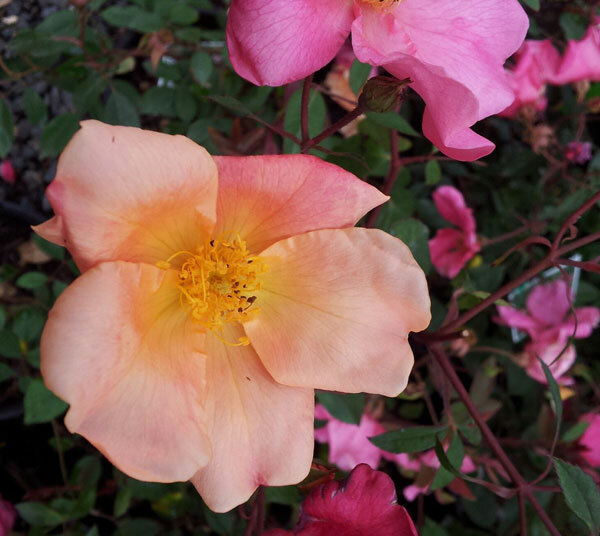 China Rose discovered before 1894 which is very commonly referred to as ‘the butterfly rose’. This rose is very highly recommend for use as a thick impenetrable rose hedge which would attain a height to at least 2 metres and spread of no less than 1.5 metres. This beautiful rose produces masses of clusters of blooms which open sulphur yellow and change to orange, red and finally crimson. Since the shrub is constantly blooming, the appearance is that butterflies are fluttering all over the shrub and the new growth is dark crimson red – a sight to behold! Hybrid Spinossisima was found before 1836 – the most amazingly beautiful and free flowering rose in our entire garden – definitely a favourite – there are only three in stock so get in quick if you want to plant one NOW … readily available and highly recommended as an addition to your winter bare-rooted order! 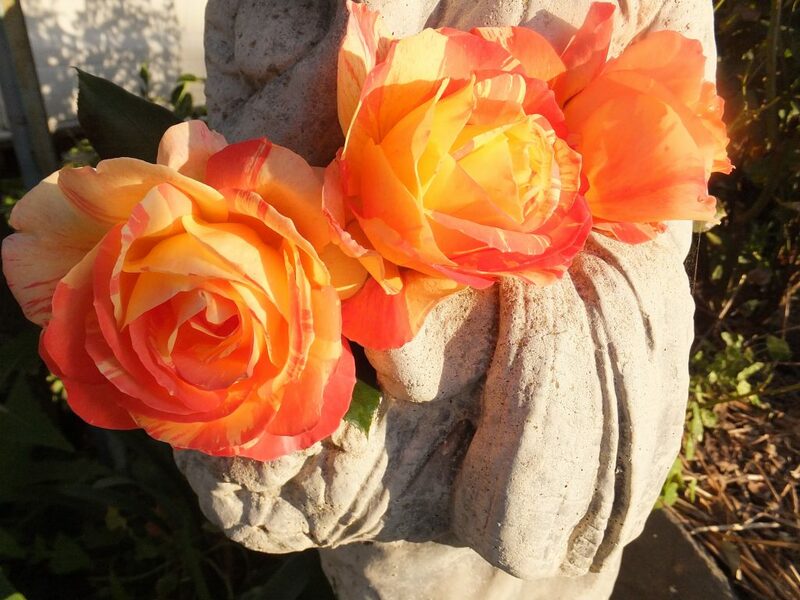 If you’re interested in heritage roses, contact the Heritage Rose Society in your State and please note: Heritage rose enthusiasts are vital for advancing the preservation, cultivation, distribution and study of old roses. It’s a heap of fun to research where a rose came from and what its breeding history and parentage is! We are now pleased to advise that our online store: www.rosesalesonline.com.au is open for taking your winter orders. We have thousands of roses out in the fields ready to be dug in May so there’s NO RUSH with ordering. Due to circumstances beyond our control, New Release 2019 roses only have ‘generic’ photos which are supplied by the agency releasing the roses so it is our plan to visit the rose fields in coming weeks; then we’ll show you our own photos and give you our personal recommendations for the New Release 2019 roses. Q. What does an angry kangaroo do? A. Get hopping mad! So does Mooi when the big bucks wake us all in the night! Do take a moment to have a cuddle with MOOI when you come to Silkies Rose Farm,CLONBINANE soon. Have a great week in your garden … Diana, Graham &amp; the team at Silkies Rose Farm. Hello dear rose friends as we enjoy a respite from the searing heat of this past week and one of the hottest summers in years. 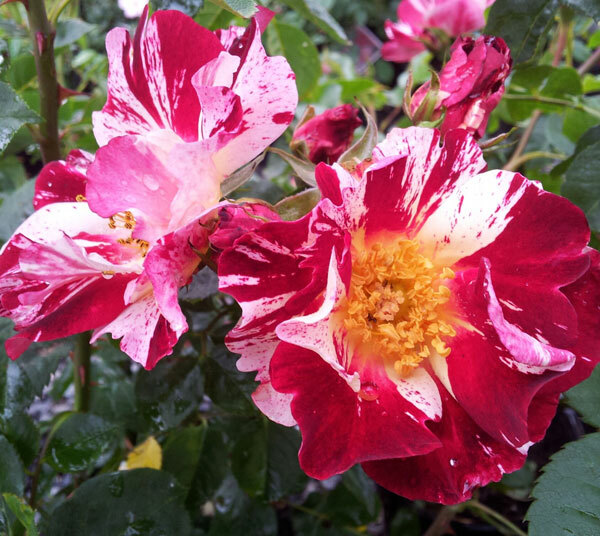 Our roses never cease to amaze us with their extreme resilience to such harsh weather! 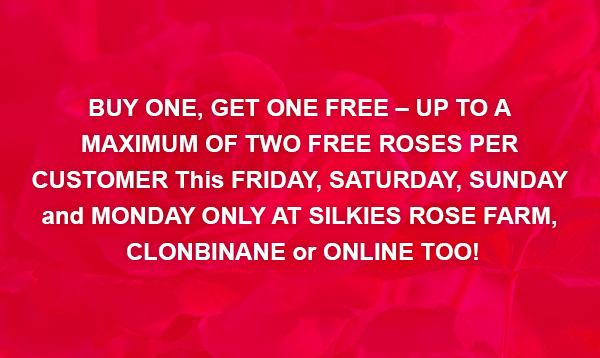 So, to celebrate their beauty and to recognise this LABOUR DAY HOLIDAY WEEKEND, we’re inviting you, our dedicated customers FOUR DAYS OF UNPRECEDENTED OPPORTUNITY to buy ANY TWO POTTED ROSES AND GET TWO FREE! 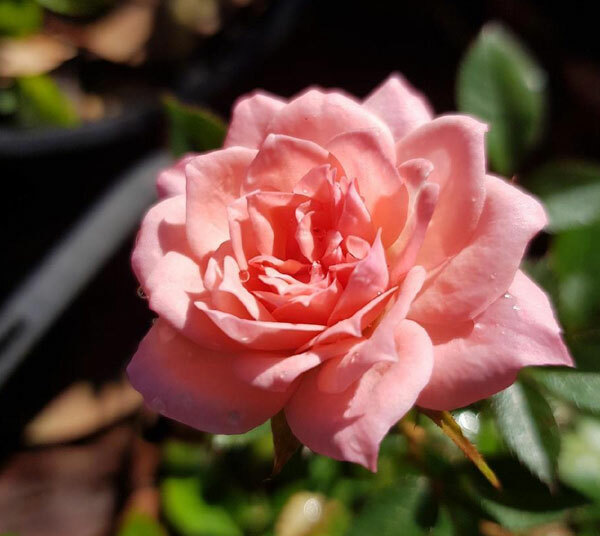 IF ORDERING ONLINE YOU CAN SPECIFY WHICH POTTED ROSEShttps://www.rosesalesonline.com.au/ YOU PAY FOR and then IN THE COMMENTS SECTIONtell us which TWO FREE ROSES you wish us to send to you. If you cannot decide, then we’ll post our very best roses at the time of posting on TUESDAY, 19 TH MARCH, 2019! When you plant your new roses, please remember to soak them, absolutely drench them when you first plant them and pour ECO-SEAWEED solution over them at planting and then at least once a fortnight thereafter – the benefits of seaweed application on roses is amazing and highly recommended for good health and profuse flowering – remember, the more foliage on any rose plant, the more flowers! It’s true! Hello dear rose friends on this, the last day of summer which heralds perhaps, a respite for our gardens with maybe some rain ??? We’ve already had some cool mornings but gosh, the sun has a punch in it while we’re watering the pots in the nursery from early morning. The cool nights will increase the incidence of fungal disease so, despite the daytime heat, it’s time to ramp up and start the organic rose management spray program to protect foliage and keep it disease free so that we all enjoy massive flowering through autumn and right up to the first winter frosts. 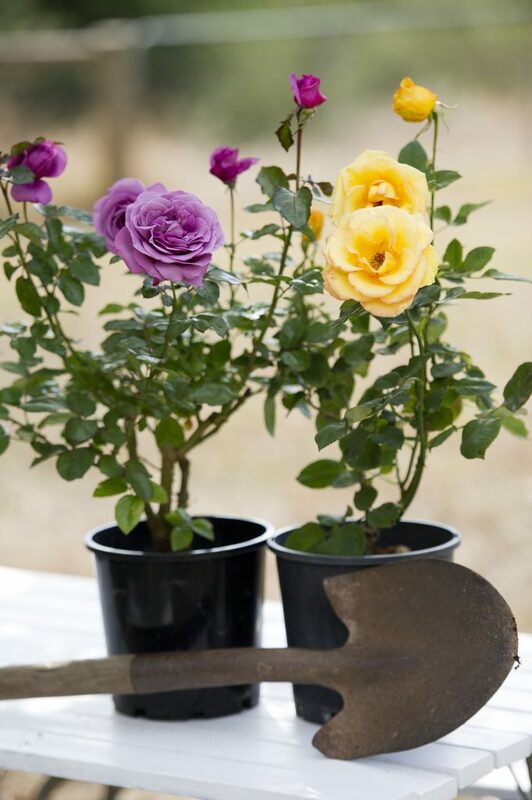 Often, I mix these three products in a watering can and pour solution over roses which appear to need a boost or show early signs of disease – obviously, using a watering can is great if you’re ‘time-poor’ but it means you’ll use more product so this method is not as economical. 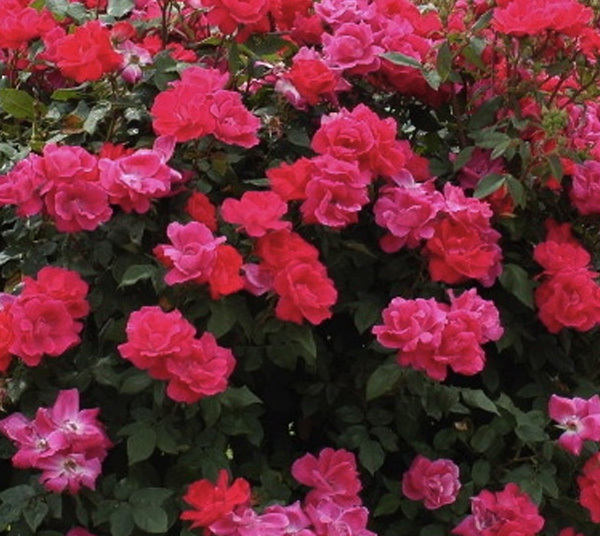 Most important that you apply this organic rose management program NOW! “Take the names of those you love most and you’ll almost surely be able to purchase them when the time comes or there might be a really great, more modern variety available with all the same qualities but a more healthy rose perhaps? Q: What animals need oiling? A: Mice, because they squeak! David Austin Modern Shrub Rose with large dark crimson heavily petalled and very fragrant blooms continually. Very suited to pot-planting for a patio. Ideal as a hedge-row. 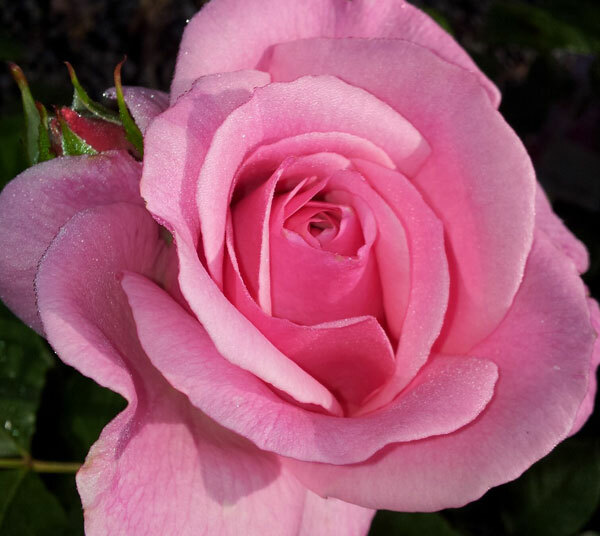 Delbard Couture Collection Shrub Rose which produces one of the most durable flowers of any rose we stock. A refreshingly bright canary yellow flowered Floribunda rose. This rose will definitely lift your spirits and so will it’s fragrance. Nice dark green foliage, free blooming, and compact growth. If you want a yellow this is one we highly recommended. 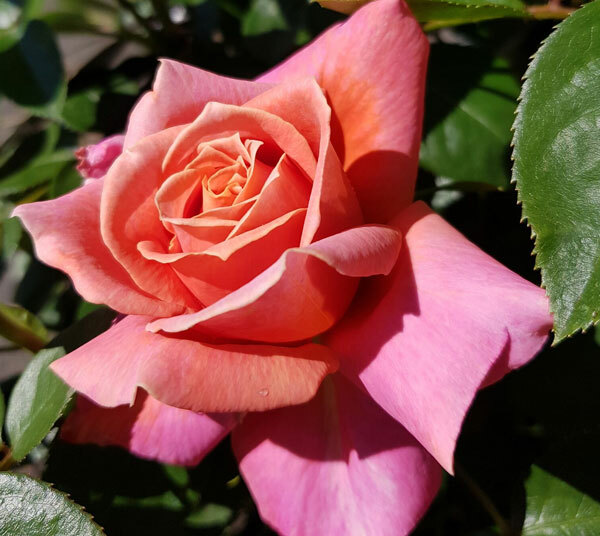 A wonderful Hybrid Tea rose – lovely healthy, spreading bush produces huge blooms of lavender/pink flowers continually throughout the season. The blooms have a most heavenly fragrance – hence the name! Highly recommended rose for cut flowers too! 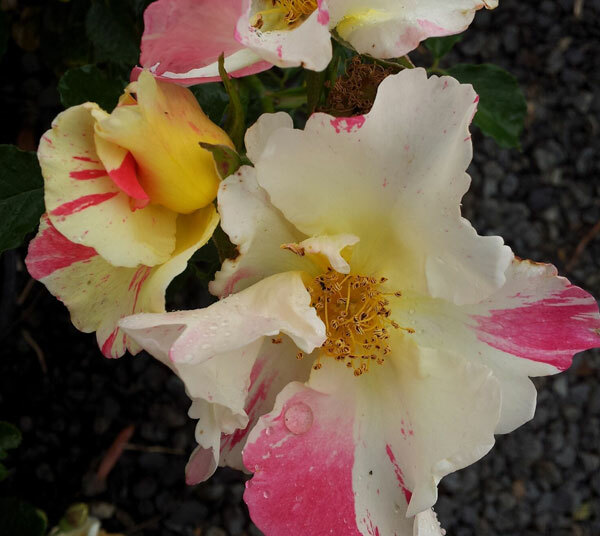 Hope you enjoy the cooler nights for sleeping and let’s hope we get rain for our gardens so that our roses put on their most spectacular autumn display in coming months … cheers from the team at Silkies Rose Farm, Clonbinane – do come for a visit soon! Hello dear rose friends as I write this date which appears on all my legal documents – another year older … sadness as this is the first birthday I will celebrate without a phone call from my Mum but I know she’s looking over us to be sure we’re tending the roses well! I’ve been managing on my own while Diana was gallivanting around Perth with her cousin Joyce – they share their birth dates on the same year during February. Mooi and I coped well and I was able to reinvent my compost heaps – while the boss is away, mice will play! This compost heap is a blend of new materials deep in the centre which should break down more quickly because of the outer layer of humus over which, of course, I will place a thick layer of raw materials (straw / horse manure with shavings) in order to retain moisture and protect microbes from intensely hot sun. I’ll soak the whole area with a sprinkler at least once a week for no less than one hour – moisture hastens breakdown of all the composting materials! Q. Where do horses get their hay? A. From their Neigh-bours … which is exactly where we get all our horse manure with shavings … we are sooooo lucky to have this resource so close and we do check when they last wormed their animals. Fresh manure from recently injected horses needs to be placed in separate areas and NOT on our compost heap as the chemicals might potentially kill our compost worms!!! When completely broken down in say, two – three months, I will use all of this compost/humus around the rose garden during winter – both for planting new roses and spread up to 10litres (one bucket-full) around established roses once they’ve been pruned. There are so many benefits in composting your household and garden refuse – it’s easy once you learn how to and you’ll definitely enjoy the rewards of a robustly healthy and environmentally sustainable garden for your family to enjoy! Q. Why do fish live in salt water? A. Because pepper makes them sneeze! Is still one of the most popular roses we sell and is rich in colour now that the nights are a little bit cooler! Is so stately and grand – magnificent in the extreme and the lush healthy foliage complements the overall beauty of this lovely rose! Has flowered and flowered through the most incredibly hot weather and the fragrance is amazing! Very highly recommended rose for sure! Q. What’s the difference between a musician and a cricketer? A. One scores a hit and the other hits a score! 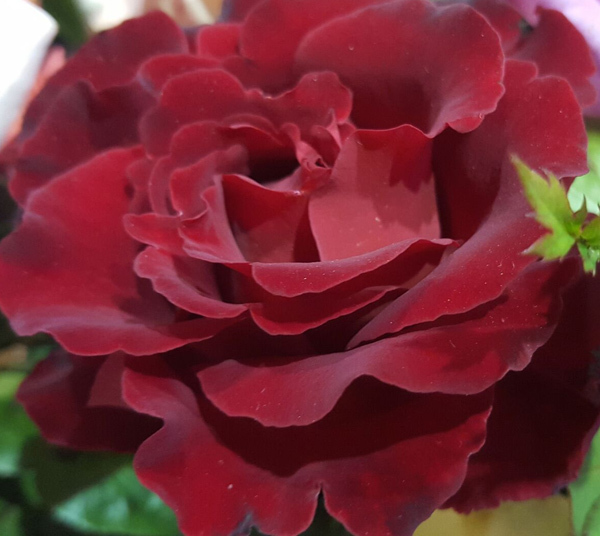 Hello dear rose friends as we celebrate ST. VALENTINE’S DAY when the most red roses IN ANY ONE DAY are sold throughout Australia! 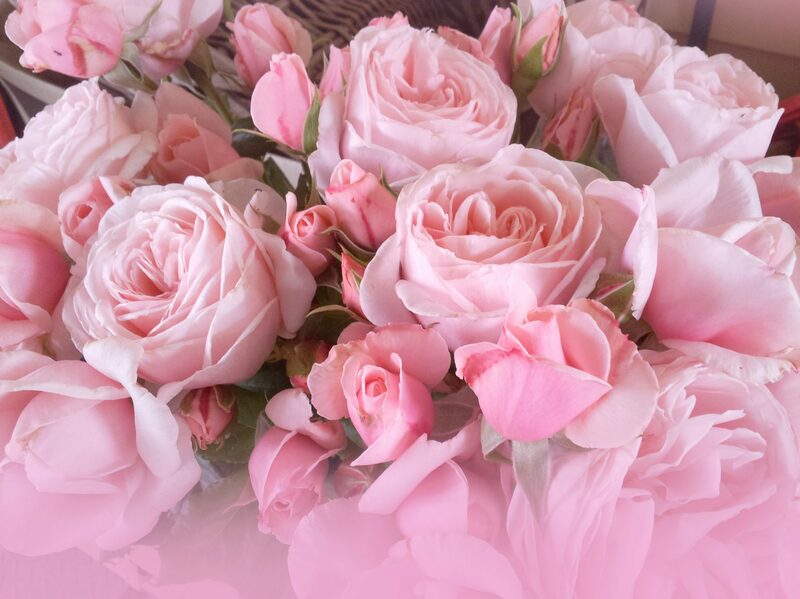 We hope you received a beautiful GIFT ROSE which means you’ll be able to pick roses from the same bush over and over to be reminded of the love in your life! On days like today I feel so happy to be a rose grower – I can pick an armful of red roses for my girl since I have MY garden filled with red roses and I dream one day, I’ll breed an absolutely beautiful red rose which will be stunningly fragrant, filled with strong dark petals and grow the healthiest foliage … you’ve gotta have a dream! Q. How do you fix a pizza? A. With tomato paste! 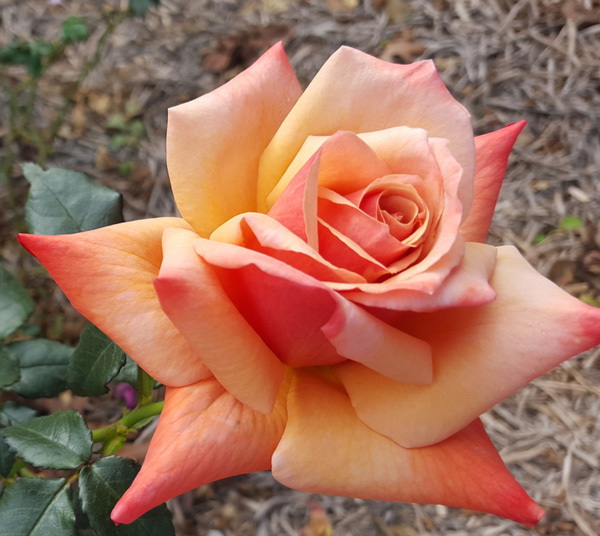 Perfectly formed Hybrid Tea blooms striped with yellow/orange/pink and salmon – stunningly pretty with a spicy fragrance. Award winning in trial grounds around the world for extreme disease resistance. The foliage is dense enough for this magnificent rose to be used to create a colourful hedge to 1.8 metres tall. 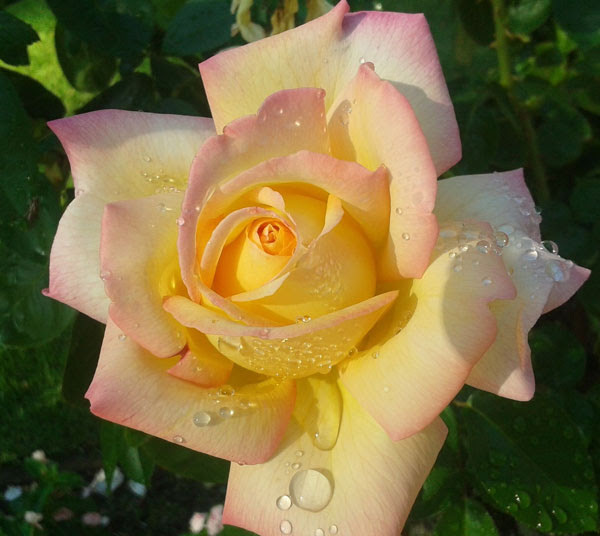 A highly recommended rose which is sure to make visitors to your garden gasp with awe! Is mid-cherry red and flowers non-stop for no less than nine months of the year. The flowers are medium sized and open with a tight bud which slowly opens to reveal a boss of yellow stamens; this is very attractive to bees so a hedge of this rose around the veggie garden or orchard would enhance pollination of veggies and fruit. This series of roses are the most disease resistant roses we have ever grown! Is frequently used as a GIFT ROSE and I’m pleased to tell you, it’s one of the most reliable and easy to grow! 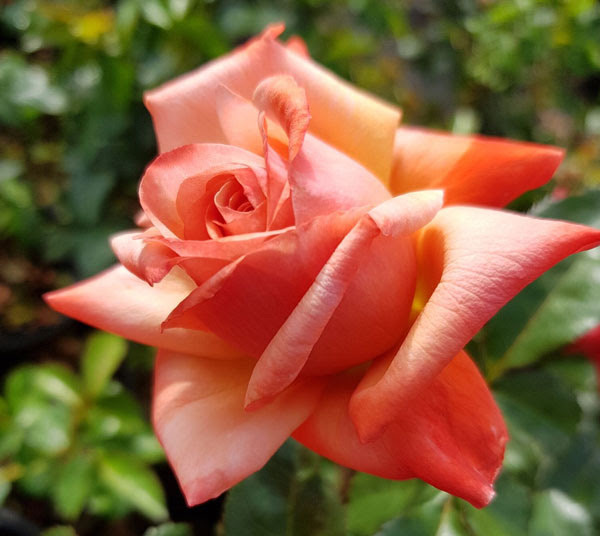 The copper/orange petals are tipped with crimson red; perfectly formed, medium-sized blooms are produced continually and the glossy lighter- green foliage is extremely lush and healthy … a great rose to be reminded of a loved one! Q. What is out of bounds? A. An exhausted kangaroo. we still have areas of green grass so our property is residence to more than thirty kangaroos each night – the bigger, taller bucks easily jump our fences so graze in the gardens while mums and bubs graze on the perimeter. Luckily, kangaroos don’t like roses and the fences are too high for wallabies, wombats and rabbits! I served a customer on Sunday who came to purchase another 600g pack of ECO-SEAWEEDand she was telling me of the success she had when she shifted roses from her Mother’s garden recently when the house was being sold. Jen cut the roses by two-thirds and lifted about half a metre round and deep root-base – at no point in the shift were the roses let to dry out!!! She covered them with damp hessian sacks and loaded them into a ute then planted them in her garden and poured ECO-SEAWEED over them once they were soaked to a slurry in their new location. Weekly applications of ECO-SEAWEED as per our directions meant that Jen now has her Mother’s roses flowering in her own garden – they were almost sure to be destroyed when the house was sold so Jen’s extremely happy we recommended she remove the roses despite the fact it was summer and we have experienced the hottest summer on record here in Victoria! Hello dear rose friends as we spare a quiet moment in memory of what devastation occurred during the Black Saturday Bushfires in Victoria ten years ago today! We hope all our customers are safe as we swelter and the rain continues to fall in Queensland – please know that your garden will recover from all these harsh weather events – our garden now is testament to that, as it was ravaged by fire 10 years ago and is a beautiful space filled with glorious trees and rose gardens for us to enjoy today! 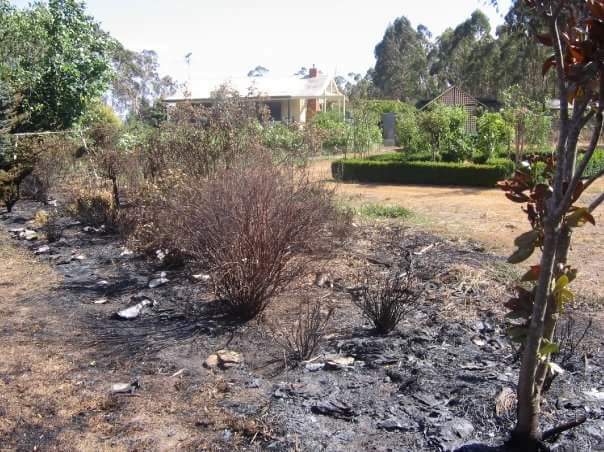 Our garden immediately after the fires. You SELECT THE COLOUR and let us select the most beautiful rose in that colour range to be posted along with your romantic message – all VALENTINE’S DAY ROSES will be posted TOMORROW or MONDAY so please do get online NOW and order a GIFT ROSE! All you have to do is print your message which Diana will hand-write into a beautiful card and then in the COMMENTS section of the order, tell us which COLOUR rose you would like us to send. There are so many beautiful roses in the nursery NOW … make your gift-giving this Valentine’s Day very simple by letting us select the most beautiful rose in the nursery on the day you present your order! Q. Why did the song do well in school? A. Because it took a lot of notes! 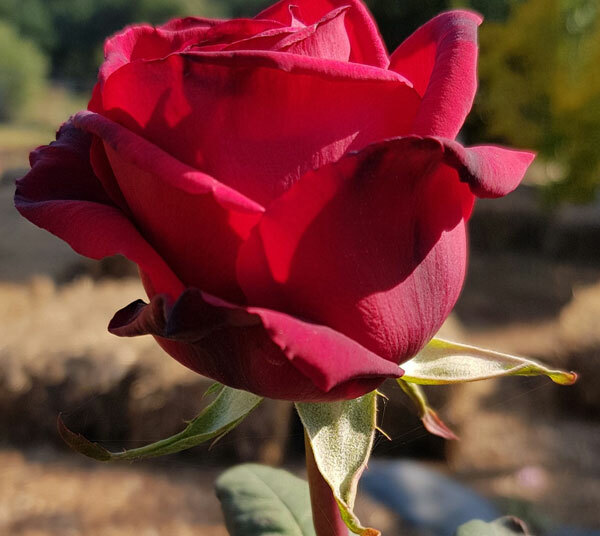 MR. LINCOLN continues to be the MOST POPULAR Hybrid Tea Rose and is the most commonly requested dark red rose because it has a HUGE fragrance, is tall and tough in all conditions throughout Australia. LOVING MEMORY produces a continual display of perfectly formed medium-dark red blooms on a very sturdy and healthy bush. 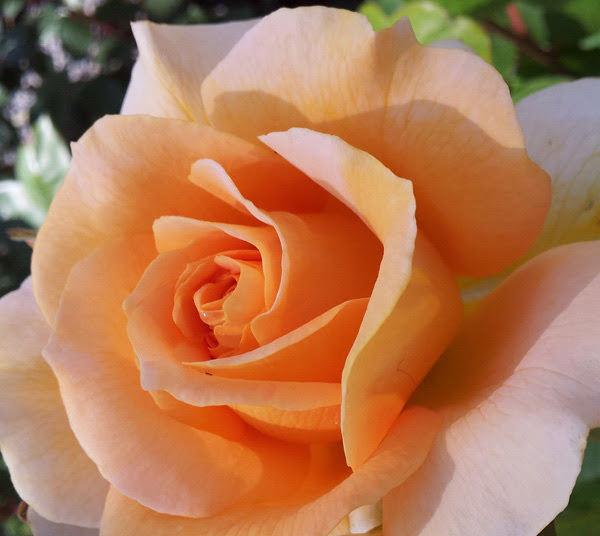 This magnificent rose is highly recommended for gifting to the ‘least garden friendly’ person when you want to offer a lasting LOVING MEMORY in the event of a death – it is such a resilient and hardy rose! and lots of others of different colours ..